Clinic Synopsis: Once the myths and misconceptions are resolved, a good reed on a good mouthpiece, held securely in the embouchure with the air directed correctly at it equals a beautiful clarinet tone. We explain how to balance these four incredibly variable factors. Simple ways to judge and correct reed adjustment issues begin the discussion. Judging an appropriate mouthpiece followed by a rational approach to blowing the desired sound into appropriate equipment will be discussed in a step-by-step format. Clinician Biographical Information Once called "the most recorded clarinetist in American Academia," Charles West's recorded repertoire ranges from standard to avant-garde, on the Klavier, Wilson Audiophile, Centaur, CRI, Crystal, and he is heard on a Grammy Award-winning Telarc CD. 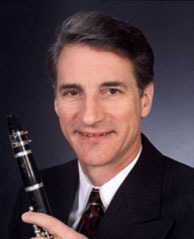 Dr. West's professional career includes thirty years as Principal or Bass Clarinet in six orchestras, teaching positions in three North American universities, and guest professorships and performances in South America, Taiwan, Hong Kong, Australia and China. He is coordinator of winds & percussion at VCU, artist-clinician for the Buffet-Crampon Corporation, conductor of the Youth Orchestra of Central Virginia and is the principal author of Meredith Publishing's "The Woodwind Player's Cookbook: Creative recipes for a Successful Performance." In 2011, he received VCUArts' highest faculty award, Award of Excellence.